After leaving school with qualifications in Woodworking, Technical drawing design, Physics, Mathematics and English. The founder, Mr Andrew R Clark, served an apprenticeship and worked for six and a half years at a very well known, prestige furnishing company in Birmingham city centre, called Thomas Woolf Furniture. Obtaining City & Guilds qualifications to a very high standard, in furniture design, preparation and construction. Being taught by a time served upholsterer, Tom Evans, who worked for them for 48 years. Working through the second world war and was once part of the team of over 30 upholsterers employed there. Traditionally upholstering using hammer and tacks. It was after being made redundant in 1984 that steps were taken to realise an ambition of owning a successful upholstery business. A workshop was leased at the New Enterprise Workshops in Sparkhill and trading started on 4th November 1984. In 1986 larger premises were found as part of a carpet store at the Swan Centre in Yardley. Due to greater demand, an apprentice and seamstress were employed. We applied to become members of The Association of Master upholsterers, and after rigorous inspections and meetings, we were accepted. Selective advertising and recommendations paid dividends, and in 1989 the business relocated to 1058 Coventry Road, Hay Mills. We worked from these premises for 14 years but needed to move because it became too small and customer parking was becoming a real problem. 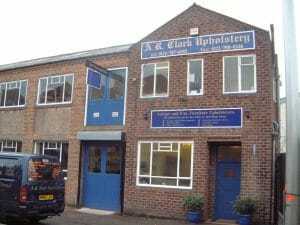 In September 2003 we moved to our new, larger premises at the rear of 801 Warwick Road, Birmingham. These premises were chosen for their location opposite Cousins furniture store, and the surrounding home improvement outlets. Over the 34 years we have been trading we have gained a unique knowledge of the furniture industry and upholstery practices. We have also gained respect among our customers, and in the upholstery trade, for the quality of work we produce. After nearly 30 years as a member of the association of master upholsterers, In July 2016 Andrew was made a fellow of the AMU&SF. An amazing recognition for the hard work and dedication over the last 38 years in the trade. Andrew, Stuart and Sue have proven to be an excellent team with many years of experience between them, producing a high-quality upholstery service. Our Future objective is to provide a quality service to the complete satisfaction of our customers. Over the 25 years we have been trading we have gained a unique knowledge of the furniture industry and upholstery practices. We have long experience of carrying out Domestic and commercial upholstery work. From small projects such as opticians chairs to larger projects such as the stadium seating at the National Indoor Arena.